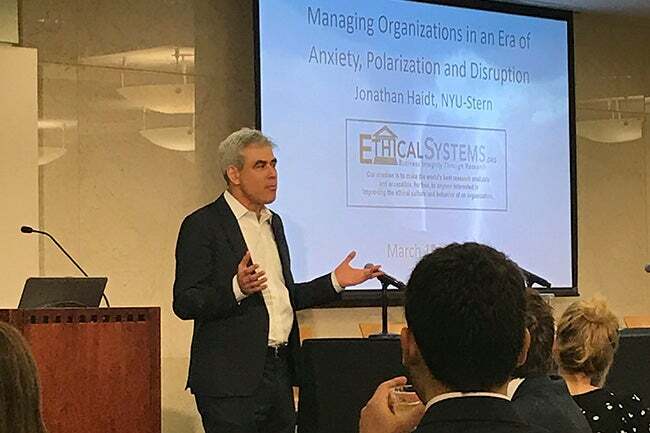 Ethical Systems, housed in NYU Stern's Business and Society Program, hosted its second biennial Ethics by Design conference, “Managing Organizations in an Era of Anxiety, Polarization & Disruption,” bringing together researchers and practitioners to discuss present-day challenges for running ethical organizations. Following welcome remarks by Ethical Systems Executive Director Azish Filabi and Ethical Systems Founder and Professor Jonathan Haidt, research presentations and panel discussions touched on individual behavior, group norms and legal/regulatory systems and how these areas relate to designing ethical systems within organizations. Our panel on the ethics of workplace surveillance and monitoring.